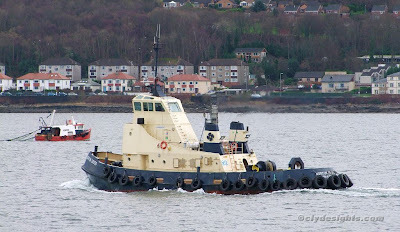 With the tug WILLOWGARTH having returned to her Belfast home yesterday afternoon, it was the turn of Svitzer's other Belfast-based tug to come to the Clyde today. NORTON CROSS, built by Richard Dunston (Hessle) Ltd in 1985, was originally built for service on the River Tees, but has since been base on the Mersey before taking up employment at Belfast. She is a tractor type tug, with twin Aquamaster azimuthing units mounted under the hull, more or less amidships, and at 27.85 metres in length, this 189 gross ton tug has an advertised bollard pull of 43.8 tonnes. Main power for her azimuth units comes from two Ruston 6RK3CM diesel engines, rated at 1,700 bhp.